Under the surface of the present, the secrets of the past. The mysteries and splendors of St. Clement and Ss. John and Paul, will allow you to travel back in time in the underground levels harboring pagan secrets. Visiting also two of the most important medieval monuments of Rome, Ss.Quattro Coronari and St. Stephan Rotondo. You’ve maybe already seen the Colosseum, Forum, a dozen of churches and the Vatican. Well there’s another Rome underground. We will start our morning journey going in underground Rome in front of the fascinating Basilica of St. Clement, whose visit is displayed on three levels. We start from the lower level, where the archaeologists have unearthed the remains of two distinct Roman buildings. In one of which a perfectly preserved Mitreum has been found. On those structures a church was erected in the early Christian period, whose remains are rich of early medieval paintings. At the present level there is a XI century church with wonderful medieval mosaics and frescoes. Let us now introduce to you one of the most serene and meditative spots in Rome, the medieval cloister of Santi Quattro Coronati will experience this atmosphere already as we walk up one of the Seven Hills of Rome to this cloister. Its isolated and reclusive location evokes the atmosphere of another age. We will encounter here a secret treasure: a work of art that was also a cogent political statement for its time. We continue with a short walk up the hill to the Church of St. Stephan Rotondo. The unique round design of the church, the austere interior makes for a refreshing contrast with many of the baroque churches in the city. Look to the gruesome frescoes of Christian martyrs at the hands of their Roman persecutors. In ten minutes we wander to the square of the Basilica of Ss. John and Paul. Below the church, there are 2nd and 3rd century Roman houses in which Christian's worshiped. The first church here was built in the 4th century. The houses beneath the church, known as the "Case Romane", have been excavated. 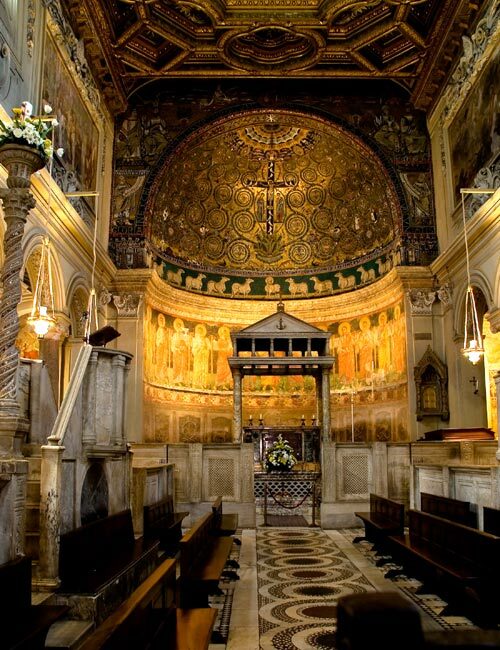 They contain a number of paintings, both Christian and pagan, including frescoes of the 2nd and 3rd century. This visit will provide you with a unique picture of how several generations of Romans lived in the old days. You will experience a single home of a wealthy family and an apartment building for artisans. The artwork here is probably the most telling, as some of it quite distinctly shows the naked anatomy of males. Tickets: St.Clement € 10. Ss. John & Paul € 8. Note: Not suitable for disabled visitors. This tour runs on Monday, Thursday, Friday and Saturday.